When my daughter was almost 15, I took her down a narrow traffic-free dirt road in northern Michigan to teach her gear shifting in our Volkswagen GTI. 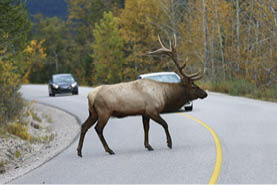 She quickly got the hang of using the clutch and gears and was quietly cruising down the road when, without warning, an enormous bull elk leapt into the road 20 yards ahead of the car! The elk, with a full rack of antlers, proceeded ahead of us filling the road while my daughter, totally unfazed by the event, just drove behind this awe-inspiring animal. Its enormous body towered above us for about 200 yards before it sauntered back into the woods. My wife, with our dog, was picking blackberries further down the road. Imagine her surprise when we told her what had happened. Since then, we have frequently seen the imprint of large cloven hooves on the same road but never another elk, which was likely part of the Pigeon River herd. (The road is just north of Vanderbilt to the west of I-75.) Has anyone else in northern Michigan, or the USA for that matter, been partnered by a bull elk on their first driving lesson?